﻿»Let them rack their brains over a programme that shall remain a mystery to everyone.« These words coming from Tchaikovsky himself gave ample grounds for a myriad of extra-musical interpretations of his last symphony, his swan song. For example, the slow, doleful final movement instead of a fiery allegro was a daring break with traditional musical form and sparked conjectures about the composer’s approaching death, which overtook him only nine days later. But even without such biographical references and programmes, the "Pathétique" has stirred people’s hearts and minds. The impression left by the first movement, in which the hectic main theme struggles to assert itself against threatening chords on the strings and where the open end is calmed by a grandiose consolatory song on the violins, is as indelible as a watermark in Tchaikovsky’s composition. 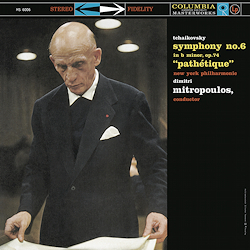 Among all the various recordings of this work, this particular reading by Dimitri Mitropoulos is a sure favourite. His masterly interpretation of the highly sensitive score finds the ideal path between sentiment and sentimentality. The maestro conveys the sharp contrasts coherently and in a well-balanced manner, allowing the melodies to flow powerfully but restrainedly. This conductor is no magistrate, but an advocate of the written notes.